Even if they're released, getting caught by a fisherman is no fish's idea of a good time. Yet, for one lucky shark, getting plucked from the ocean by a catch-and-release style angler may actually be the best thing that could have happened to her. 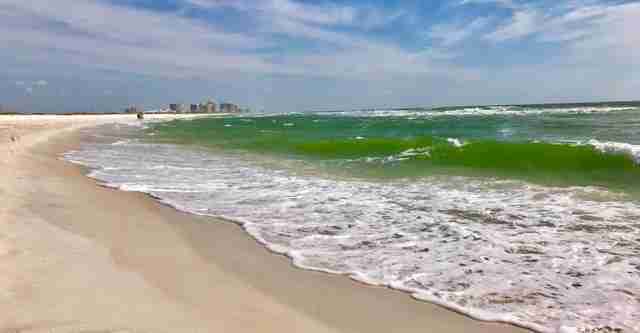 On Saturday, Maggie Caver of Sun Shots, a family photography business in Alabama, was out enjoying a day on the white sands of Gulf Coast State Park when a dramatic scene began unfolding before her eyes. 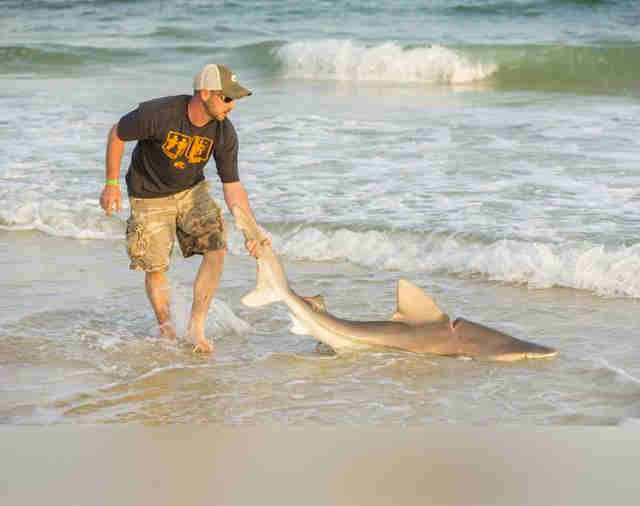 A local fisherman had hooked a shark, and was reeling his catch to shore to then set free. But, as it soon became clear, the animal had been in dire straits long before taking the bait. "We noticed something was wrong with the shark," Caver told The Dodo. "We thought something had taken a bite out of it." Turns out, the shark's body was wrapped by what Caver came to learn was an engine belt which, like so much human-produced waste, had somehow ended up drifting like a lethal trap out at sea. "That belt had a death grip," she said. "We felt like it had been on there for at least six months to a year, just based on how much the shark had grown around the belt." But on this day, the shark found hope in the unlikeliest of places. Realizing the shark would likely perish without his intervention, the fisherman sprang into action — carefully trimming away the trash that had slowly been strangling the life out of that majestic ocean predator. Caver watched as the angler effectively saved the animal's life, sensing in that moment a glimmer of what seemed to be gratitude. "He cut the belt off, and the shark made a funny grunting noise as if she was saying, 'Thank you,'" she said. 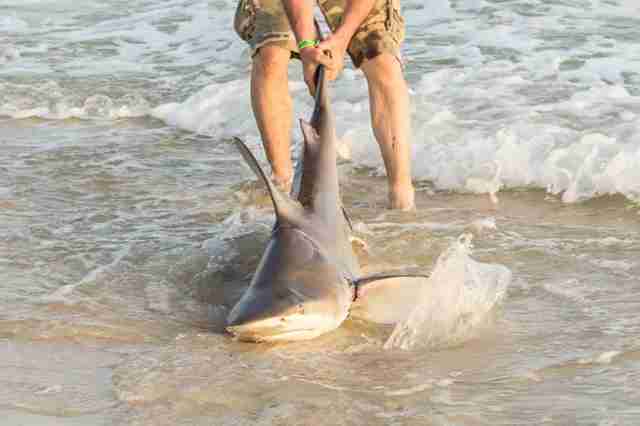 The fisherman then removed his line and released the shark back out to sea. Though perhaps a bit shaken by the act of getting reeled in moments earlier, the animal was infinitely better off than if she had not been caught. "The shark swam away as if it were in great condition," Caver said. "It was an amazing thing to witness." 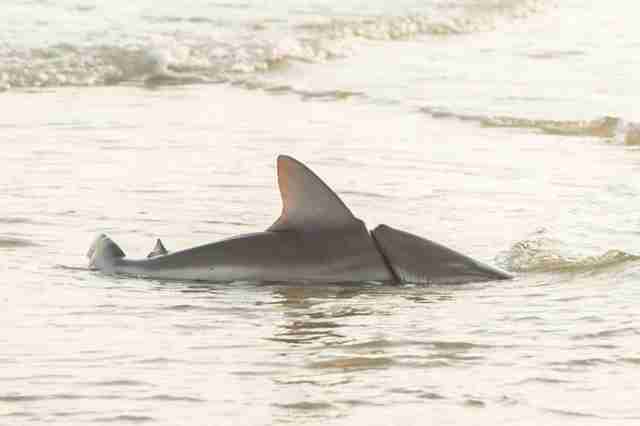 Fortunately, the shark had been saved just in time — but not all sea creatures will be so lucky. Every year, an estimated 13 million metric tons of plastic waste end up in the ocean, claiming the lives of an untold number of marine animals who mistakenly eat or, like this shark, become entangled in it. Caver hopes that the incident she photographed will come as a wake-up call to the growing problem of ocean pollution, knowing most creatures affected by it are perishing unseen with no hope of being saved. At least in this case, the shark got a second chance. "It was a fishing story with a happy ending," Caver said.